Sylhan has the latest technologies, which are coupled with the highest level of skill and expertise to create a fully integrated precision machine shop specializing in refractory and other specialty metal products. Sylhan provides cost-effective capabilities that meet the most exacting specifications. 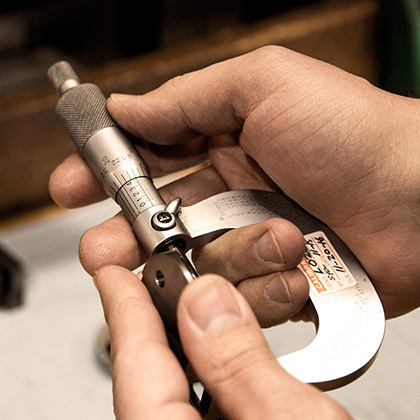 Our state-of-the-art equipment along with years of experience results in high-quality, defect-free components and enhanced supply chain value for all our customers. Our team prides itself on being reliable under pressure and manufacturing parts that others have failed to produce. Sylhan is uniquely capable of producing large quantities of hard-to-machine parts on a production basis adhering 100% to our customers’ specifications. Our knowledge, experience and processes allow us to operate 24 hours a day, five days a week, with a full complement of highly skilled employees. Sylhan provides the highest quality materials that meet or exceed industry standards for applications in various channels including aerospace, medical, electronics and industrial. All materials are certified to our customers’ demanding specifications. Our expertise allows us to machine tolerances to 0.0001”. The Sylhan team excels under pressure internally, and maintains tremendous external relationships through our third party logistics and focus on customer value and service. Our application engineering team will work with you to ensure we provide the lowest cost, highest quality product with timely delivery that you can count on, with the goal of creating long lasting and successful partnerships with our customers. Our team operates nine CNC Wire EDMs in a self-contained area, 22 CNC mills—both horizontal and vertical—and 10 automated CNC turning centers. As a company that prides itself on delivering defect-free products every time, our inspection equipment includes OGP Smartscope Flash CMM and a Niton XL-800 Alloy Analyzer (three CMM machines), and utilization of Statistical Process Control to maintain strict inspection requirements. Our team is continuously evaluating processes, revising production methodology and reducing costs. Having extensive manufacturing experience with production products has created a discipline of continuous process improvements. Our focus on lean manufacturing allows us to be responsive to our customers’ needs and provide enhanced supply chain value for our partners. EQUIPMENT TO MEET AND EXCEED OUR CUSTOMER’S AND POTENTIAL CUSTOMER’S NEEDS.